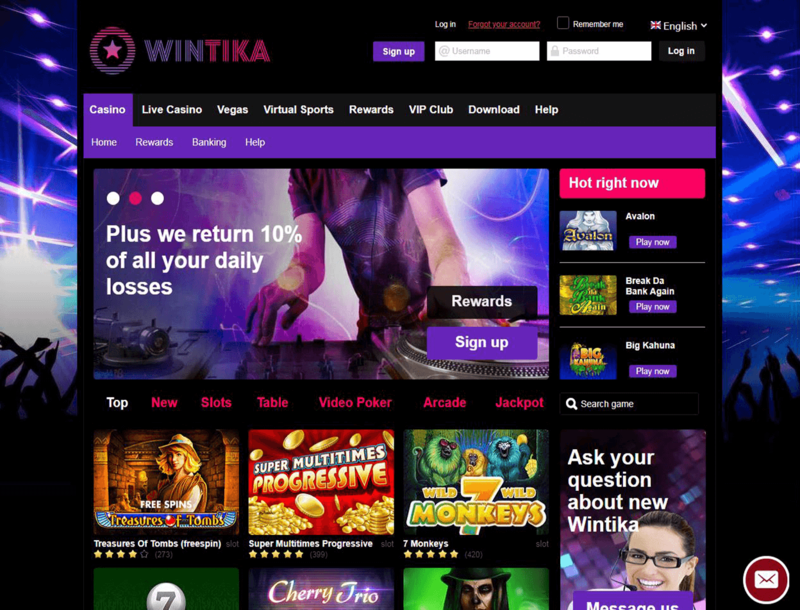 Wintika Casino is a HighWeb Ventures N.V. gaming hub that has been providing betting titles to players since 2015. The site runs on a 1ClickGames casino platform which has a rich game library from several providers such as Playson and Microgaming. This platform also gives you many betting markets for virtual sporting events. The casino has a license under the Curacao government, which means you will not get the best protection when you get into any legal problems with the site. Another thing to note is that certain countries are restricted from signing up with the site such as the US and UK. On the other hand, Wintika supports multiple languages used in countries it is available in such as German and Norwegian. In addition to this, the site supports different currencies like EUR and NOK. Everything about Wintika Casino is like a wild party that never ends. Can the games and bonuses make you feel like getting down on the dance floor with everyone who knows your name? Read on to find out. There are three promos on Wintika Casino. These include the familiar welcome bonus and cashback offers. Continue reading to know more about these incentives. The Casino Bonus is a 100% welcome bonus up to US$200 which applies to your first deposit only. You can cash out this bonus by meeting the required 35x rollover. This means that you need to bet the bonus and deposit amount 35 times on qualified games. It is important to note that the highest bet amount you can make with the bonus is US$5 on any game. Wagers that are bigger than US$5 might make the casino void your winnings and stop you from cashing out your bonus. Loss bets are often very hard to take for any player. You could be one royal flush away on a video poker game, but the high payout round never comes even after putting down more than US$100. The good thing is that Wintika Casino has your back with the Daily Rebate which gives you back 10% of your losses in one day. To qualify for this promo, your losses need to be at least 20 EUR in one day. There is no limit to the maximum amount of rebate you can get from this promo. Furthermore, the rebate cash is not treated like a bonus, which means you can withdraw 10% of your losses without worrying about a rollover requirement. You will get a better rebate offer for virtual sports wagers with the Super Cashback promo that returns 21% of your losses. This offer applies to bets in the Virtual Sports section. You will receive a rebate of your cash the day after losing your bets. This cash can be withdrawn at any time because this bonus is not subjected to a rollover requirement. It is important to note that the promo is not available in certain countries such as China and Singapore. Most of what Wintika offers are generic. But what makes the gaming hub stand out is the generous rebate and cashback promo. While other Bitcoin slot sites offer this promo one or two days per week, this online casino will give you a rebate every day. One of the strong parts of Wintika Casino is its game library that covers three different sections. Majority of the video slots, table games, and other betting titles are in the Casino and Vegas sections. These sections provide titles from five gaming companies such as Microgaming and Playson. There is a wide variety of casino games for you to enjoy on the site. There are slots like Paranormal Activity, Journey to the West, and Queen of Gold while those with a progressive jackpot feature have their own category such as Mega Moolah and King Cashalot. Outside of the slots library, you can find video poker variants that provide some interesting twists to the five-card stud poker rule. Under the arcade tab are more alternative betting games like Poker Dice, Race the Ace, and Treasure Tomb. There are also live table games that let you play casino favorites with a real dealer. The massive game library is easily a reason to spend time on Wintika Casino. One bad thing, though, is that there are two sections for casino titles. This means that you have to perform more mouse clicks just to browse all the games on the site. Despite this small problem, the many slots on the casino ensure that you will find something you will want to bet real money on. The gaming hub supports a large variety of fiat payment methods like credit cards and e-wallets. You can even use your Bitcoin to fund your account in this casino. The currencies supported by the gaming hub are EUR, SEK, DKK, NOK, CAD, AUD, NZD, USD, and BTC. There is nothing much to complain about with the casino’s deposit methods. The added Cubits for Bitcoin payment is a nice touch to allow anyone who owns the crypto coin to play on the site. The banking options could have been one of Wintika Casino’s strong suit because of the support for both fiat and crypto payments. However, having no option to withdraw Bitcoin can leave crypto coin owners frustrated. Nevertheless, the low minimums of €10 for deposits and €25 for withdrawals make this site attractive. Wintika Casino has most of the things you want out of a gaming site. The casino has more than a hundred different slots and other games that will make you want to keep partying even after the sun is up. Plus, the games are available on mobile devices, letting you take the party with you anywhere with an internet connection. The downside of this casino, however, is the limited withdrawal option which does not even let you withdraw your winnings to your Bitcoin wallet. In addition, the bonus offers are lackluster compared with what other gaming hubs offers like Bitcoin slots free spins. If the banking options and bonus offers do not bother you, then Wintika Casino is well worth your patronage. Otherwise, there are other gaming sites that let you withdraw your winnings in crypto coins and that have better promotions. Check out other casino reviews to find the one that suits your taste the most.